Black goo. 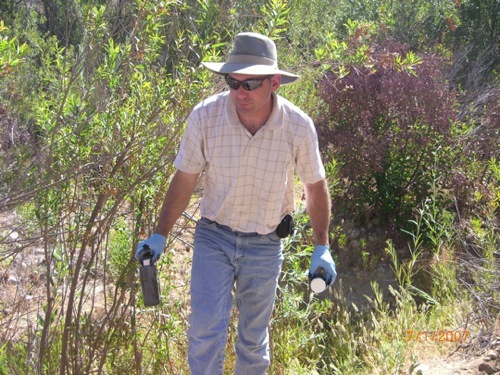 Man with benzo(a)anthracene in Runkle Canyon July 2, 2007 with Simi officials. Leave it to Simi Valley’s Radiation Rangers to uncover more than just contamination in Runkle Canyon, where KB Home hopes to build 465 homes in the shadow of radioactive Rocketdyne. The citizens group has discovered that the developer has dug itself into a hole of its own making in its Response Plan to clean up the canyon by promising to remove two giant mountains of slag material that are leaking pools of toxic sludge. Benzo(a)anthracene is on the Proposition 65 list of chemicals “known to the state of California to cause cancer.” The Rangers have calculated, in their 58 pages of Response Plan comments on their Web site StopRunkledyne.com, that the poisonous black goo in Runkle Canyon exceeds the EPA’s Preliminary Remediation Goal by more than 39 times.